The Texas State Mysterium Ensemble gave a multi-media performance of new and experimental music for the College Music Society Fifty-Ninth National Conference October 28 in Santa Fe, New Mexico. The ensemble is led by Senior Lecturer Richard Hall, and the program included a composition, LIGHTFORMS 1: Constellations, by School of Music Director Thomas Clark. Faculty Todd Oxford and Bobby Lopez performed at the conference, and music professors Cynthia Gonzales, Amanda Soto, Nico Schuler, and Carolyn Watson gave presentations. This entry was posted in alumni students faculty NEWS and tagged Bobcat, CMS, College Music Society, experimental music on October 31, 2016 by Thomas S. Clark. Two bus loads with 98 Texas State students traveled to Fort Worth recently, all members of Intro to Fine Arts classes taught by Daris Hale or Ian Davidson. 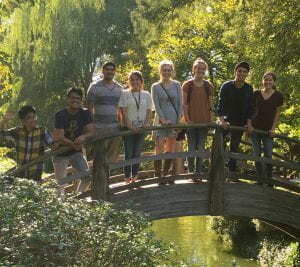 They had great fun experiencing with their instructors’ guidance the art and architecture in the Kimball Art Museum, its new auditorium designed by Lorenzo Piano, and the nearby Japanese Garden. This entry was posted in alumni students faculty NEWS on October 20, 2016 by Thomas S. Clark. Todd Oxford has been named as an American Prize Finalist in the Professional Instrumental Solo Division. Winners will be named next month. The American Prize is a series of new, non-profit, national competitions designed to recognize and reward the very best in the performing arts in the United States. Oxford performed as a guest musician with Austin Opera’s orchestra during the regional premiere production of composer Kevin Puts’s Manchurian Candidate. He also recently presented master classes for the Copperas Cove ISD Bands. Alumnus, Lawrence Varela-Halbert, is a Band Director for the district. This entry was posted in alumni students faculty NEWS and tagged American Prize, saxophone on October 11, 2016 by Thomas S. Clark.